I love all kinds of soups, stews and beans. I could eat them everyday. My daughter is the same way. Her favorite restaurant in Reno is Sup, and she will choose soup 9 times out of 10 if she is given the choice. I think “soup loving” is genetic because my mom adores soups as well, and she makes amazing soups, stews and beans. My mom has never really used recipes for her soups and beans. She just throws in some of this and some of that, and they always turn out incredible. This recipe came about in the same manner. I had been married for maybe a year, and asked mom if she could give me a stew recipe, and she just gave me some “guidelines.” I mix this recipe up, but I always cook the stew meat in the oven first. 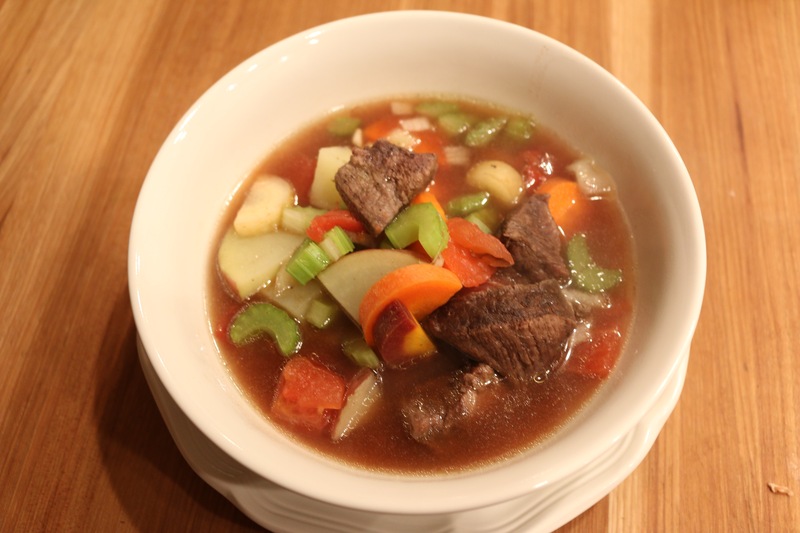 It makes it so tender, and the juices that accumulate have amazing flavor! 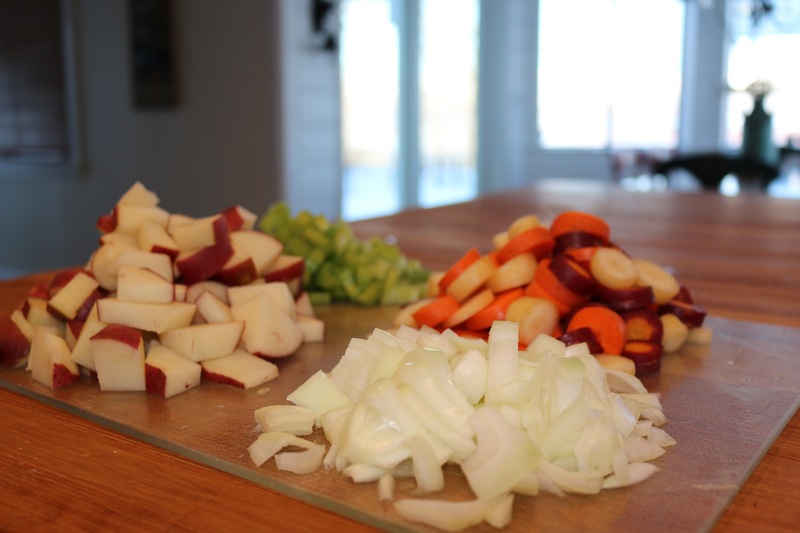 I know not everyone likes to cook with “guidelines,” so I measured out everything today as I was making this stew. However, one of the beautiful things about this stew is you can add more veggies or leave out some of the veggies, and it will still be a great stew if you follow the instructions for cooking the stew meats and the stock. I like to make my own beef stock with root veggies, herbs, and marrow bones. I will blog about this at a later date. If you don’t have home made beef stock, that is not a problem at all. If I don’t any that I have made on hand, I will try and get an organic, boxed one from the grocery store. Rinse your stew meat in cold water and sprinkle with garlic salt and pepper. 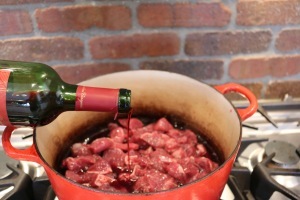 Put the stew meat in a dutch oven or pot and add 1 cup of wine (or beef stock). Cook in oven at 275 degrees for 4 hours. Meat should be very tender. If it is not tender, cook it longer. Make sure you do not run out of liquid. If you start to run low, add more. You should be fine with a cup of liquid though. Once the meat is tender, take your stew meat out of the oven, and put the entire pot on your cook top. There should be some juices in the bottom of your pot, and that is great. Leave them, and add all the rest of the ingredients. Bring the ingredients to a boil, then turn the heat down to low. I let all these ingredients simmer together on low for 45 minutes. If you think your stew needs more flavor try adding some more salt and pepper. If it still needs more flavor, you can use some more beef base.